Detalle is the newest hotspot to hit Ortigas. 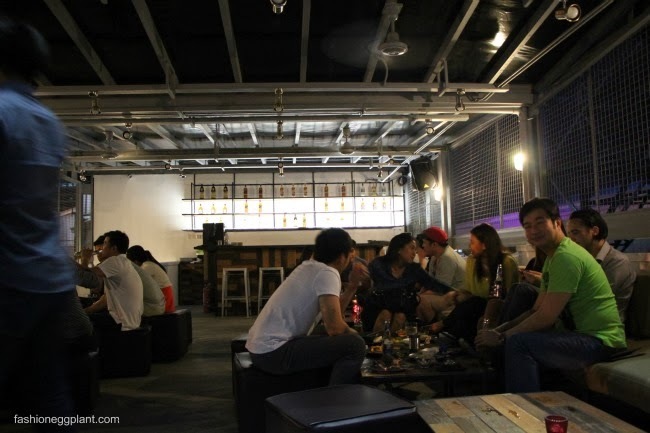 Conveniently located on the corner of Julia Vargas and Meralco Ave., Detalle is more than just a bar to while the night away with friends, it's also a gastronomic destination. Detalle derives its name from the close attention to detail put into every aspect of the establishment. The owners are meticulous down to the smallest detail and make sure that everything matches and has a perfect balance and flow - from the interiors to the dishes served. The ground floor is a great space for a casual date or dinner catch up with friends like what we did. We were super eager to get together again after the long holiday break and Detalle provided the perfect backdrop. It was comfortable, clean, quiet and very conducive to conversation. An average plate at Detalle will set you back around P300. Las Sardinas - baguette with spanish sardines, marmalade and topped with a fried quail egg. One of my favorites. I love how the sweetness of the marmalade balances out the salt and spice of the sardines while giving a great contrast in texture to creamy egg yolk. Housemade Ricotta - anything filled to the brim with cheese is always a win for me and these are no exception especially since their homemade. Topped with a sliver of candied crunchy bacon to add a bit of sweetness, salt and crunch to every bite. Yummy! Crispy Pig Ears - I passed on this since I am not a fan of pigs ears but my friends say it was good. Arancini Risotto Balls - risotto made with a hint of tomato, mixed in with some mozzarella, breaded and topped with aioli sauce. Lamb Meatball Sliders - considered as bar chow on their menu but this would be my favorite out of everything I tried and would have it any day as a main course. The spicy garbanzos served on the side instead of the usual french fries add a nice touch and do wonders for taking away the "umay factor". Squash Soup - one big generous serving, good enough to split in two. It has chorizo chips and chesnuts. Quite rich and a little too sweet for my taste but if you're fond of rich dishes, this could be right for you. Haricot Verts - crispy speck, arugula, asparagus, creme fresh with crispy bacon in balsamic dressing. Pizza Margherita - dough is made fresh in the kitchen, good with chili oil. Truffle Penne - surprisingly light despite being a cream based sauce. Truffle flavor is just right and not too overbearing. D Burger - a 300 gram patty with arugula, bacon jam, bleu cheese and aioli. It's huge, women can split in two, men can have a feast over it. Braised Pork Sandwich - tender pork in sourdough bread with apple jam, fried egg and dijon mustard. Pork is similar to that used in chashu ramen with a slightly sweet/soy flavor. Love the contrast of the dijon against the apple jam. Grilled Salmon - another favorite of the night. Served with caper cream sauce, roasted veggie and asparagus risotto similar to that of the risotto balls. Thick salmon slab that was cooked perfectly. Slightly charred on the outside but still juicy on the inside. A delicate dish that is a perfect predecessor for a night of drinking. House Steak - steak with creamed spinach and mashed potatoes in a worcestershire cream sauce.